My passions include creating fiber art: hand spinning yarns, dying , knitting and triangle loom weaving, and of Course a lifelong love affair with animals. I hold my BA in Fine Art and have my Certification as a Pet Care Management Specialist. Raising Angora Rabbits must have been my destiny! The best of two worlds! Located in breathtaking Southern Vermont, This Is Where the Finest Angora and English Lop Rabbits Are Selectively Bred & Raised to A.R.B.A. & I.A.G.A.R.B. standards. Having many A.R.B.A. Registered & Grand Champion Rabbits in Giant and German Angora Varieties. Love your Buns Rabbitry is a Certified A.R.B.A. Rabbitry (American Rabbit Breeders Association, ARBA RABBITRY #R188, Also belonging to the N.A.R.B.C. 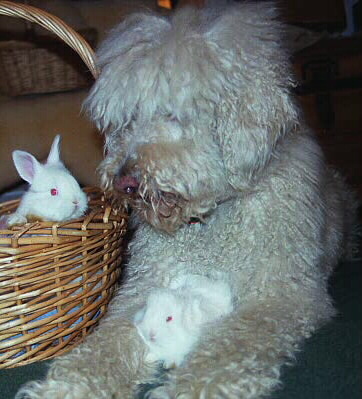 (National Angora Rabbit breeders Club), I.A.G.A.R.B. (International Association German Angora Rabbit Breeders), And Lop Rabbit Club of America . If you are interested in Rabbits for Show, Wool or Companionship then Please contact Love Your Buns Angora and English Lop Rabbitry to see what rabbits are currently available for sale. Please set this page on your BOOKMARK so you can stop in often to see our updates on available Angora Bunnies, Cages, Books & more currently for sale. THIS PAGE DEDICATED TO THE MEMORY OF MY CANINE COMPANION MICHAEL; HE LOVED UNCONDITIONALY FOR 0VER 17 YEARS AND STILL LIVES ON IN MY HEART. THANK YOU MICHAEL FOR BEING MY FRIEND. YOU ARE MISSED. 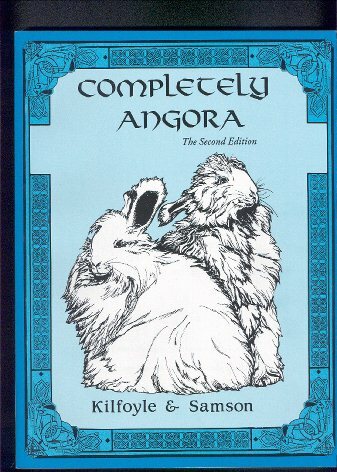 The Angora Rabbit Has had an interesting past. It was regarded as a god or an idol by the ancient Babylonians. It was a pet for the French royalty of the middle ages, and currently the Angora a is producer of one of the finest wools on earth. 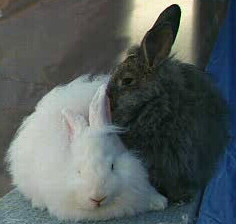 Angora Rabbits come from Ankara, Turkey in Asia Minor. This is also the home of the Angora goat. When the Medes and the Persians conquered the Babylonians, they found well established worship of the long haired rabbit god. The Angora rabbit was also a pet in the Sultan's harem. To carry your bunny place his head under your arm facing your back, using your other arm to support his bottom. Long sleeve shirts are recommended to keep his nails from scratching your arms. PLEASE DISCOURAGE SMALL CHILDREN FROM CARRYING BUNNIES...AN IMPROPERLY CARRIED RABBIT COULD RESULT IN HIM BREAKING HIS NECK/BACK, PARILIZING HIMSELF, OR KILLED BY BEING DROPPED ON IT'S HEAD. small children should be closely supervised, by an adult, who may seat child & rabbit on the floor. Please be aware that a rabbit should never be picked up by its wool or ears. SUPERVISE YOUR RABBIT IF IT IS LET LOOSE IN A ROOM. Be sure it does not chew on electrical cords, poisonous house plants, fiberglass fabrics, or other dangerous items. YOU CAN LITTERBOX TRAIN YOUR BUNNY THE SAME WAY YOU TRAIN A KITTEN. Young German Angora Rabbits should be brushed once a week. Failure to do so will result in fur mats and a potential health risk to the bunny, called wool-block (potentially fatal). I recommend a small metal slicker like the kind used on dogs or cats. A metal comb is handy for getting out small mats as well. Difficult mats should be removed with a scissors to avoid stressing the bunny. I also place a bath towel on my lap and put the bunny on that. The towel will catch any stray hairs and keep you from getting scratched. A grooming stand is also a way to go for grooming. Be very careful to use one hand to cover bunny's eyes and face when brushing so you don't get the slicker brush in his eye. PLEASE NOTE: When brushing or combing be sure to hold fur tightly at the skin line with your other hand so as not to irritate bunnies skin or cause pain. Grooming takes getting used to for you and your bunny. Try it for 5-10 min a day till you both get the hang of it. Once most German angora reach about a year or year and a half old they no longer need much brushing at all since they will then have their adult coats complete with undercoat, awl , and guard hairs. the german angora adult coats do not mat the way a young rabbits coats can. With my adult germans I usualy don't do any grooming except to blow out their coats every 3 months when I am going to harvest their wool for spinning. I do however maintain their manicures every month though. Bunnies nails should be clipped every 3-4 weeks. Be careful to only clip the part without the blood vein (known as the quick). If you accidentally cut the quick use some septic powder (sold for dogs) to stop the bleeding. Angora Rabbits can get stressed out from too much pulling during grooming, be gentle, as too much stress can cause your bunny to become prone to illness. 10 min grooming sessions a couple of days in a row are better than 1/2 hour session in one day. I am not an advocate of "plucking" as a means of eliminating the long wool. I use very sharp sizzors about 3" long blades to clip away the wool. It is my humble opinion that most folks do not know how to pluck therefore cause damage to rabbits hair folicles, skin and lower rabbits immunity by the stress and pain caused by this cruelty. Even when a trained person properly plucks there is scientific proof that damage to wool production in the lifespan of the rabbit is a result. plucked rabbits density is diminished due to the irreperable damage to the hair folicles in the epidermis. In the summer be sure your rabbit is in shade all the time, heat stroke can kill very quickly. I also recommend giving your rabbit a hair cut,(hare-cut, LOL) to prevent overheating in extremely hot temps. Sometimes I keep a plastic bottle of water in the freezer to put in cage for bunny to lay on when it is real warm out. Bunny will lay on top of it to cool off. Remove bottle when thawed, refill & freeze again. Frequent Grooming and Proper Diet are the key. Give your rabbit unlimited hay daily and 4-6 papaya tablets on top of a good alfalfa based 18-21% protein pellet feed. laxitone or petramalt (cat hairball remedies) every few weeks helps as well. IF YOUR BUNNIES STOOLS BECOME STRUNG TOGETHER LIKE A PEARL NECKALACE BEWARE OF DANGER!!! IF THIS HAPPENS RECOMEND FEED ONLY HAY, NO PELLETS, GRIND PAPAYA TABLETS & MIX IT WITH FROZEN UNSWEETENED PINAPPLE JUCE & FORCE FEED W/EYEDROPPER 9CC'S 3X'S A DAY. ALSO REMOVE PELLETS (FOOD), FEED 1" RIBBONS OF PETRAMALT 3XS A DAY ALSO, BUT AT LEAST AN HOUR APART FROM THE PAPAYA PINAPPLE DRINK. FEED LOTS OF HAY. ***Call your Vet for advice & additional treatment. I am not a vet and therefore make no claims- nor do I assume any liability for diagnosing or treating rabbits. *** When stools become normal round balls again , resume normal diet. DO NOT BATHE YOUR RABBIT. PROTECT IT FROM RAIN, DRAFTS & EXTREME COLD & DIRECT SUN. Never let your rabbit run loose outside. birds of prey can grab it up in a heartbeat, stray dogs and other hazards can be life threatening. It takes just a minute for you to be distracted long enough for tragedy to occur. Even in a fenced in 'play' area, your rabbit can dig under and get injured or lost. Angora can not survive in the wild. Please; be responsable with your bunny. Love Your Buns Rabbitry thanks You For visiting Our Homepage times.